I have a 2011 Corolla LE that I've replaced the wiper blades 3 times on, with different brands each time, and the drivers side blade never sits flush against the windshield. The last 3 or so inches just doesn't make contact. Any suggestions on what might need adjusting here? I have purchased the correct size (26 Driver 16 Passenger). Do you mean sits flush at the bottom of the windshield, or is actually pulled off the windshield and not making contact? Possible that you can post a picture of what is happening here? I don't think the Corolla has a wiper "parking" function where the wipers will be pulled down and flush to the bottom of the windshield when turned off, but they should be pretty close. Possible that the wiper arm jumped the splined shaft - actually got clocked away from the bottom. But that shouldn't have happened, unless you removed the wiper arm itself. Another possibility is that the arm got bent during the wiper replacement. Here's a couple of pictures, i tried to show it the best I can. Towards the driver's edge of the windshield, it makes contact just fine. But to the center, it's raised off about a centimeter or so. The picture with my finger underneath it is just to show the gap, i am not lifting it in anyway. 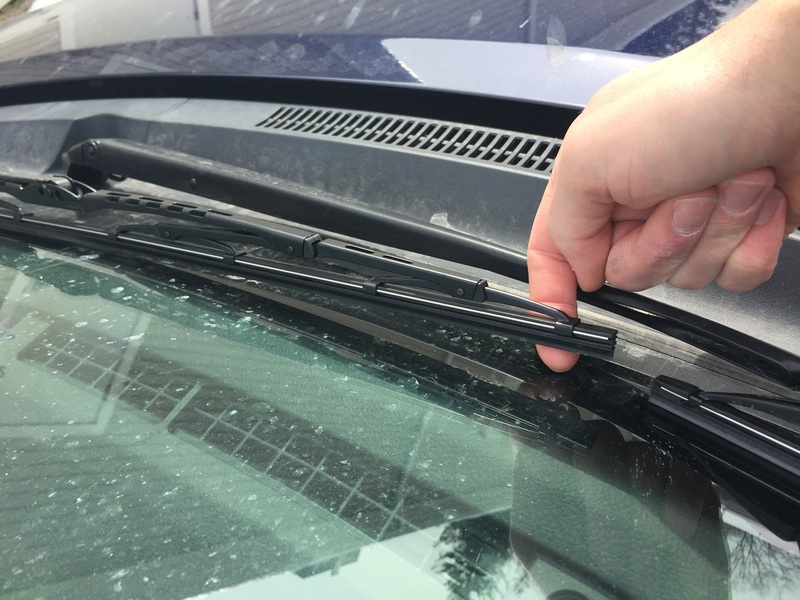 If I push down on the arm of the wiper, the blade flattens to the correct position, but reverts as soon as I lift off it. Got it - I'll have to take a look at these when I get home, can't see the links at work. But from your description - sounds like the wiper arm itself got twisted somehow. That or the spring that holds the arm against the glass has somehow weakened or come loose. 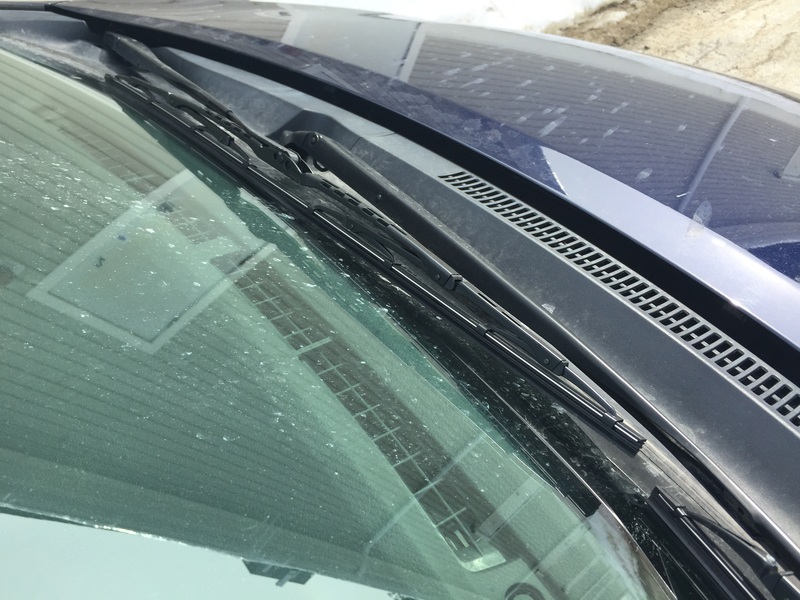 Did the original wipers get stuck/frozen on the windshield in the past or were forced to push lots of heavy snow these past several weeks? Might get lucky and be able to use some pliers or adjustable wrench (tape the jaws with some tape to prevent them from scratching the wiper arm) and twist them the other way (ie, bend them toward the windshield. If you are unlucky, like my wife's car (she tried to run the wipers when they were full on frozen to the windshield) - the metal arm closest to the wiper blade actually separated and twisted from the bottom half of the wiper arm - had no choice but to replace the whole arm ($105 for right, $95 for left). More than likely, the springs got weak. Supposedly, you can just replace the springs - but I have not found a good source for those. I've heard that some CARQUEST places will replace the springs for you (you buy the springs, they install with no labor charge) - but no idea the costs of the springs themselves. Took another look at them - definitely looks like the spring on the wiper arm is too weak to push down on the wiper blade. It also sort of looks like the wiper arm is binding somewhat - but since you already went through a number of sets - probably not the wiper blade. Could try bending the metal arm slightly toward the windshield - see if that helps push the wiper closer to the glass. If that doesn't work - you'll have to replace the spring / replace the wiper arm. Isn't your wiper arm touching the wiper frame? Like Fish mentioned, the wiper arm needs to be curved back down for proper clearance and more pressure.